Why shell out serious cash on outdoor garden items when you can make them yourself? 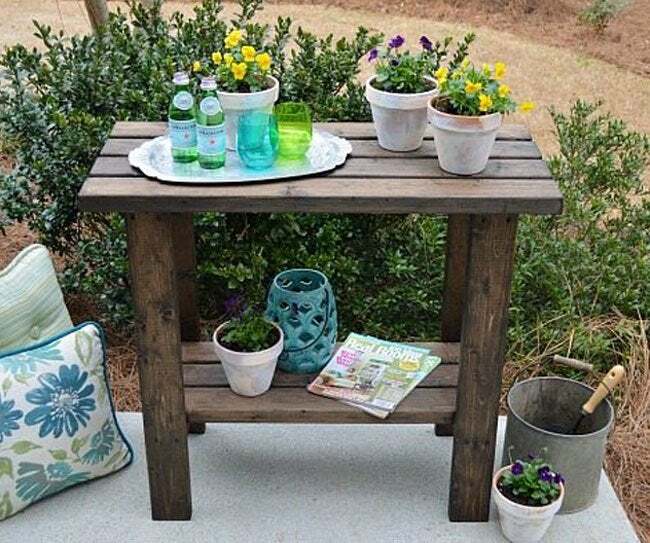 Check out these six DIY furniture ideas to create a one-of-a-kind space surrounding your plant beds. With the right furniture, you can turn your garden into an outdoor reprieve for rest and relaxation. But, unfortunately, the weather-proof options don’t always come cheap. That’s why we pulled together six DIY garden furniture designs—building your own outdoor furnishings allows for total customization without emptying your wallet. 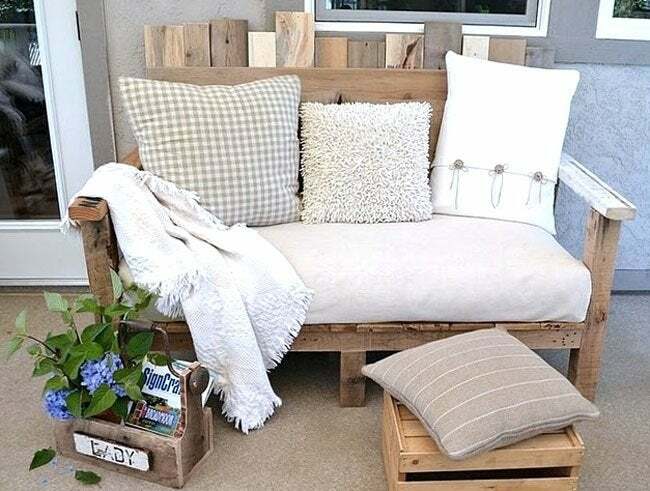 Whether you’re looking for a place to put your feet up after hours of labor or a table to keep you organized while you get your hands dirty, there’s sure to be a handmade option that will meet your gardening needs. 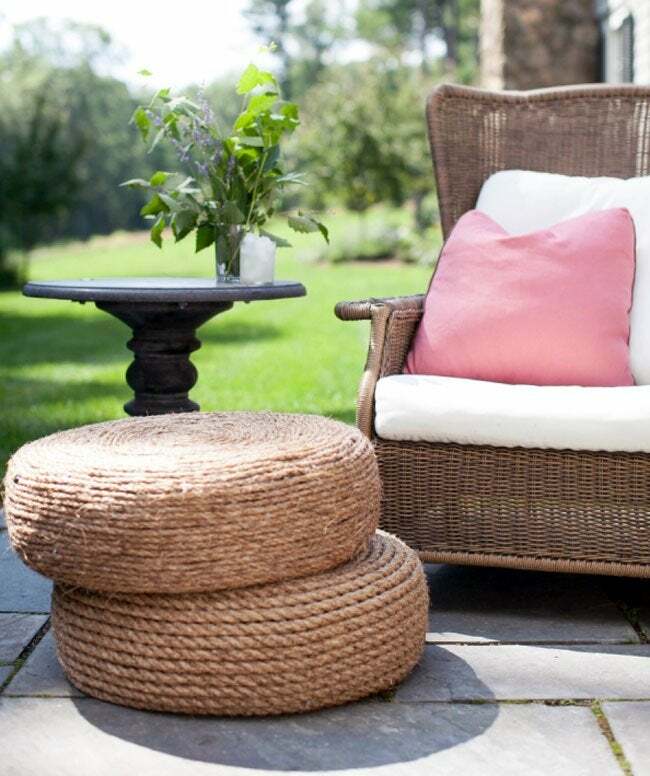 You don’t need a store-bought ottoman to add functionality to your patio. Try making your own by following this clever project from Style Me Pretty—all you need is a spare tire, two types of rope (nylon and sisal), and a hot glue gun. Start by wrapping the nylon rope around the sides of the tire, then hot gluing the sisal rope in a circular pattern on top. You can paint the whole thing with a light coat of sealer so that it survives during rainstorms. Gardening is a lot easier when you have a dedicated set-up that’s just for re-potting blooms. This two-shelf table from Refresh ReStyle can be constructed to store your trowels and pots beneath the area where you’ll work. When you’ve wrapped up construction, give the table a rustic look with a stain of your choice. The entire project will take the length of an afternoon—and just $15 out of pocket. Not bad! To build a backyard chair that’s both comfy and sturdy following this design idea from the How To Specialist, you’ll want to invest in heavy-duty lumber and plywood. The key to this construction is making exact measurements upfront, then doubling up in terms of fasteners: Use both a waterproof glue and a power drill to attach each carefully cut 2×4 together. An exterior wood stain would ensure that your hard work doesn’t succumb to water damage. Then, repeat the process to make a pair for your yard. When it comes to garden furniture, the flexibility provided by a bench that seats anywhere from one to three people is always best. This original design from BobVila.com incorporates a variety of lumber in different sizes—2×2s, 1×2s, 1×3s, and 1×5s—to build an interesting striped design right into a sturdy frame, each width of slat highlighted in a different finish for emphasis. 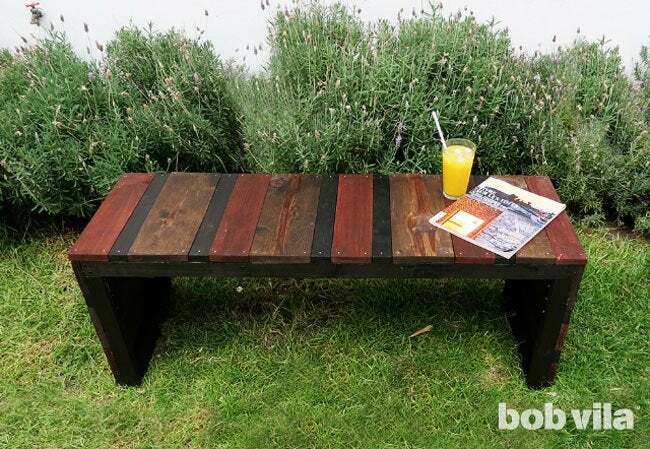 Thanks to two protective coats of varnish, the result is a weathered-looking bench that can be kept outdoors year-round. 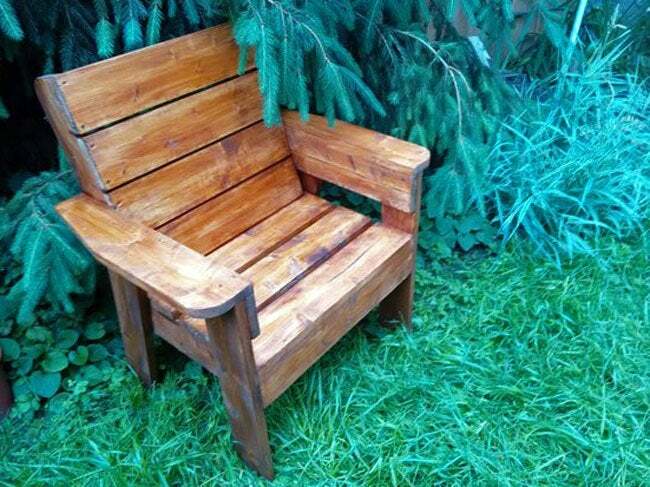 A robust selection of leftover wood and screws are all it takes to assemble this one-of-a-kind outdoor seating option. Building a solid frame that doesn’t sag or get warped over time requires plenty of center supports, but Funky Junk Interiors‘ step-by-step makes this DIY garden furniture look doable. Also, a pro tip from the handy blogger who dreamed up the design: Find the mattress first before diving into the woodworking, since the soon-to-be seat cushion will dictate the size of the furniture’s frame. Rather than searching for the perfect “table for two” to match your garden aesthetic, follow this tutorial from The Shabby Creek Cottage and make your own—to the tune of $15. The only lumber you’ll need to pick up is a handful of humble 2×4s, which the DIY blogger then advises cutting with a power saw into the variety of pieces that make up this garden classic. 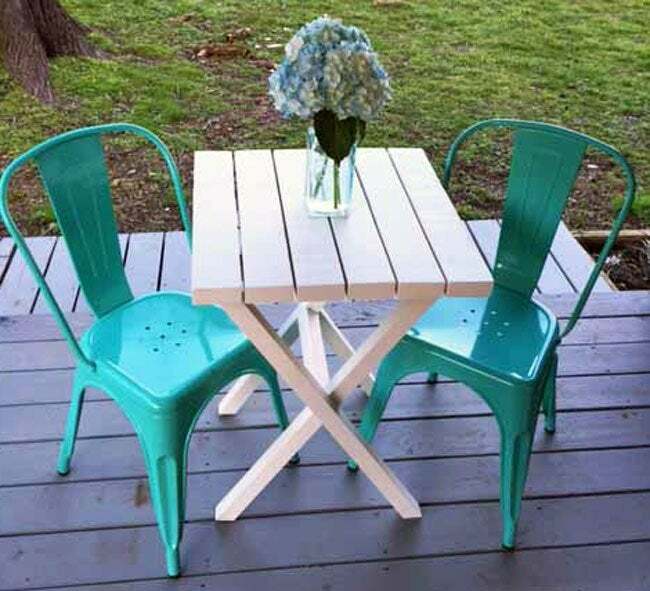 Sanded down and assembled with a power drill, the wooden bistro table only needs a fresh coat of paint to provide a pop of color in your backyard hangout.